Price will adjust based on your custom options selected, you must select the options you want. Click on pictures for enlarged view. Pictures have customer specific options on that particular build, all bumpers are build to order. See FAQ-Pics page link above to help you decide on which options you need. Email or call us if you have any questions, were here to help. Thanks! 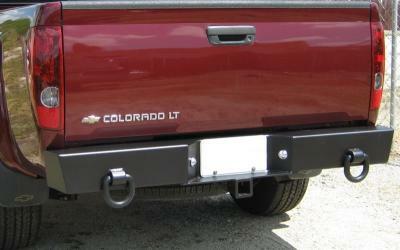 This rear multicarrier bumper replaces your OEM bumper with the welded strength of steel. Price shown is for the base bumper and from there, is fully customizable so that you can include the best options that are important to you. This all steel construction multicarrier bumper has been designed to provide for optional fully welded tow points, gas can carriers, tire carrier and other accessories. All welds are ground and finished to give a professional, high quality appearance. Made with the highest quality standards by experienced craftsman using the latest technologies. Our bumpers are 100% made in the USA with by American craftsman and materials! The Multicarrier will work with both barn door style SUVs (shown here) or with a standard liftgate style door. There is no interference with frame mounted receiver hitches.